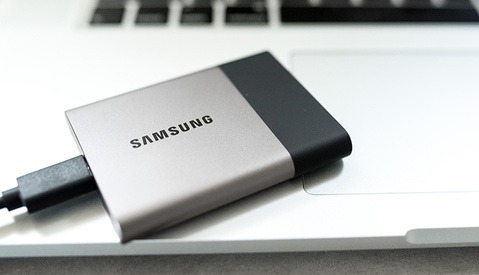 My favorite drives of the last several years have been these newer, compact, portable SSD drives, especially as they’ve become more affordable. 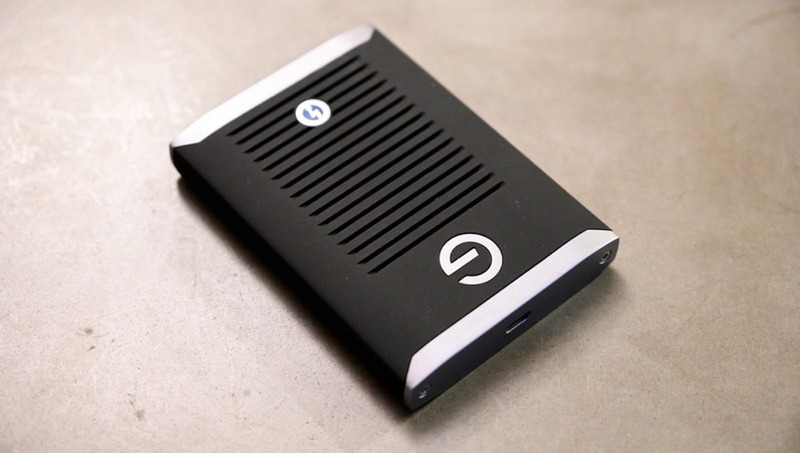 But G-Technology’s G-Drive Mobile Pro SSD is in a class of its own for those that need real speed. Until a few years ago, 500 MB/s SSD speeds were considered blazingly fast. But with the permeation of Apple’s über-fast internal SSDs (usually made by Samsung, Toshiba, or SanDisk) working their way up to 3 GB/s speeds and doing for SSDs what the original SSD did for general hard disk drives, content creators have gotten used to the new insane speeds. And when you get into offloading 4K, 6K, and even 8K footage, I could see why these speeds are considered necessary. While I still love the compact drives such as the Samsung T5 I’ve reviewed before, power users will want something more. 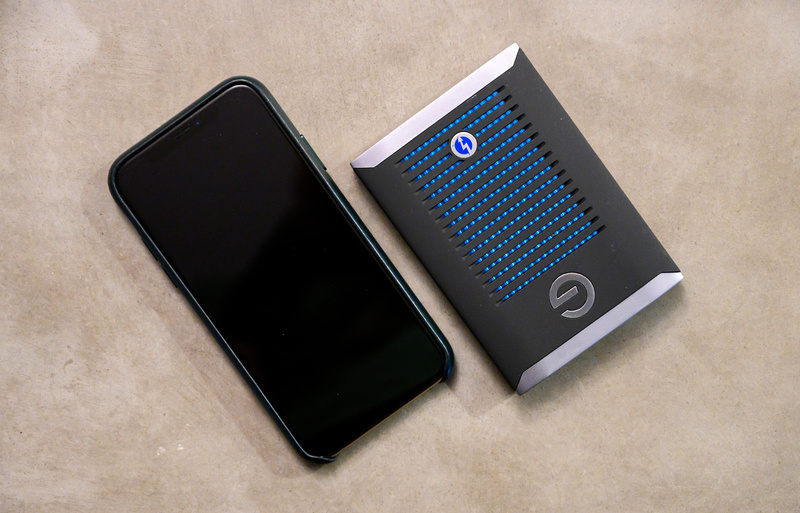 Enter G-Tech’s G-Drive Mobile Pro SSD. While not as compact as the T5 or Western Digital My Passport SSD drives, the Mobile Pro still stays relatively compact and does look the part of an insane speed demon. In fact, the design of the Mobile Pro — aggressive enough with its heat-sink-styled (and functioning) enclosure to connote the speed at your fingertips, but professional enough to thankfully not include childish red and blue flashing LEDs all over it — is positively wicked. Thankfully, it also adopts the better USB-C connector of Thunderbolt 3, which is much more reliable than the terribly unreliable USB-3 Micro B connector that connects and disconnects based on the smallest nudges six months into ownership. I would have given bonus points for dual Thunderbolt 3 ports, but none of the drives in this category feature that as it is, and the daisy-chaining applications of a portable drive are slim to none anyway. Needless to say, Thunderbolt 3 also allows for some incredible speeds. 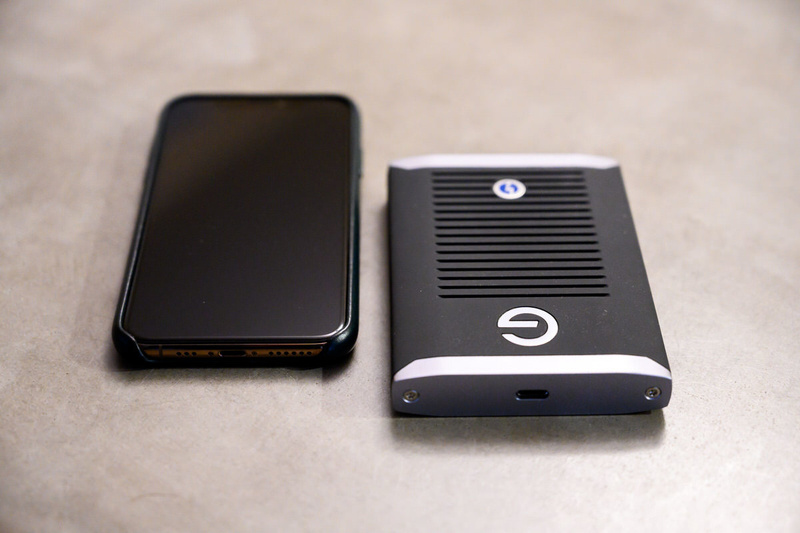 The G-Drive Mobile Pro SSD is shorter, almost as narrow, and a bit thicker than the iPhone XS with the standard Apple case on it. The Mobile Pro SSD’s official transfer rate of up to 2,800 MB/s (or 2.8 GB/s) will keep up with your latest MacBook Pro and puts it in a class of its own (almost). 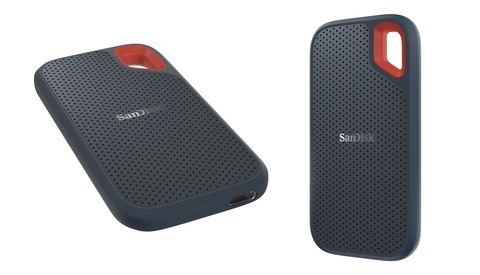 The recently released Samsung X5 is also at the same level, although with a three-year warranty (the G-Drive gives you five years), and we haven't had the chance to test it yet. Of course, real-world tests show a few differences, mostly due to the fact that transferring hundreds or thousands of smaller files takes longer than transferring a single big chunk of data. This is normal and true with every drive. But you’re still going to see the same relative speed bump with the Mobile Pro SSD over its less-capable competition. APFS-formatted, this drive reaches its true potential. First, you’re going to want to ensure the drive is formatted best for your system. For Mac users, APFS formatting, which is specifically intended for use on SSDs, performed much better. 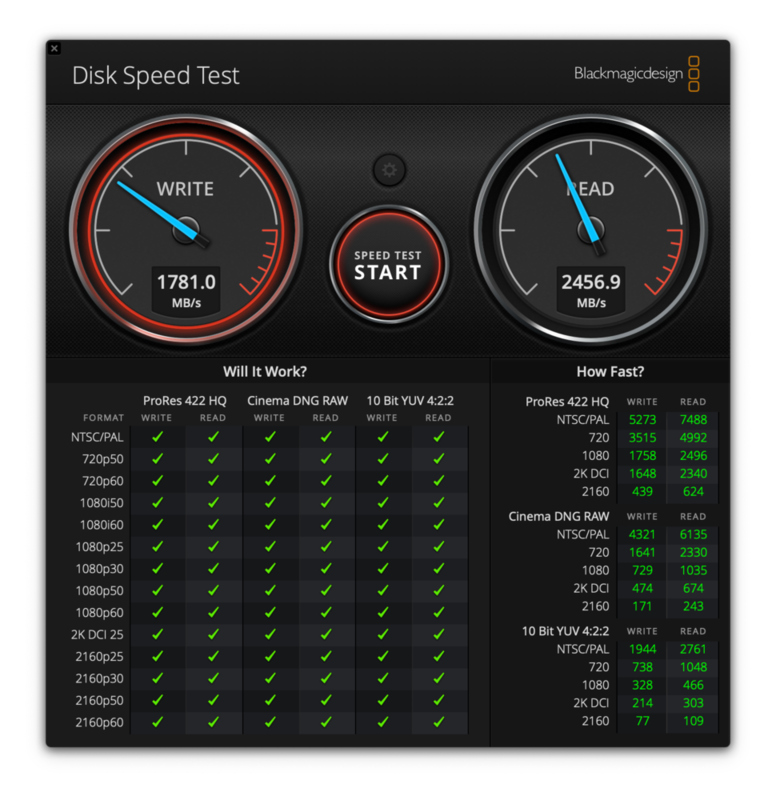 Blackmagic Disk Speed Tests showed read and write speeds of 1.275 GB/s and 1.3 GB/s, respectively, when formatted as Mac OS Extended (HFS+). Reformat to APFS, however, and you’ll hit a much-improved 2.45 GB/s to 1.78 GB/s read and write speed. Real-world tests transferring folders of many, tiny individual files (a 78 GB iTunes music folder complete with system files) yielded sustained transfer speeds well over 800 MB/s. But that goes up for transfers of larger files, and you would see a relatively slower rate on those 500 MB/s drives as well. It is worth noting just for a moment that, for the same price as a single 1 TB Mobile Pro, one could technically get four 500 GB portable USB-C SSDs and use a software RAID option to get similar speeds and four times the storage. But this would take all four ports on the computer, as to the best of my knowledge, there is no decent four-port Thunderbolt 3-outputting USB-C hub that could take advantage of those speeds. And more importantly, this increases your likelihood of data loss by at least a factor of four (probably more given the complexity of it all). It's just incredibly impractical. But the point is two-fold: 1.) It's still pricey to go for this much speed, but also, 2.) Even if you could do it, you still have to go through all of that just to get something similar in speed to what is being offered in a single, reliable, compact solution, here. You are getting what you pay for. It’s hard to find something to complain about with the G-Tech G-Drive Mobile Pro SSD. It really is at the top of the pack, including price — that’s an easy go-to. But you do get what you pay for with the security of a five-year warranty, and that’s something you just don’t see much in the electronics world. It’s really limited to the more premium technology products, which, as a G-Technology product, this clearly falls within. If you want maximum portability without sacrificing portability, throw this in your bag; one or two of these will reduce any standard bottleneck you’d normally experience from going more portable. Again, I still haven't tested the Samsung X5. And I imagine it's an excellent drive just as well. Even with the three-year warranty compared to the five-year G-Technology warranty, it would be compelling, especially since the X5 is also offered in a 2 TB capacity (but don't be mistaken, you'll pay dearly for it). At the moment, though, these seem to be some of the only drives of their kind from such reputable companies. They really are leading the way. 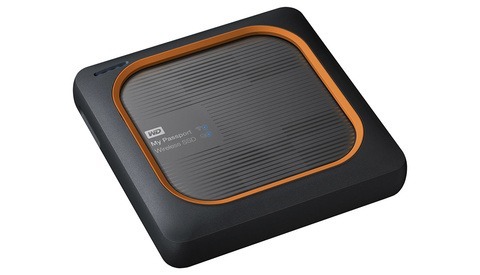 The G-Drive Mobile Pro SSD is available in 500 GB and 1 TB variants for $249 and $499, respectively. If you’re looking for a still-reliable, more portable USB-C option and don’t need those blazing speeds, check out the G-Drive mobile SSD R for $209.99 in the 1 TB size. I reach 2800 MB/s formatted as Mac OS Journaled. Read & Write Speed. Faster than my 2016 Macbook Pro. The TB3 is incredibly fast. I combined it with a Sonnet CF2 card reader. The SSD also connects to my 2013 Mac Pro via the Apple adapter (TB3 to TB2). Now I'm waiting for G-Tech to make a 2TB model. You can get a 1TB NVME for <$250. Anandtech has an article to DIY with a TB3 enclosure, it isn't efficient, but it's >$50 cheaper than this and you come out with a spare 250GB drive. I'm guessing we'll see $50 enclosures by year end.